Well my ponies and I have been extremely busy so far this summer. Both Juggy and Magic have been out most weekends , either show jumping , showing or going cross country. It’s been great and we’ve had some amazing results lately but my mum tells me it’s been down to hard work, training and finally finding a good routine and schedule perfect for the ponies. We train every week with Louise Anderson who knows me really well and knows exactly how far to push me and my ponies. We work really hard on the basics and improving the confidence in our partnership, especially with Magic. We’ve worked on good warm up routines to practise at shows . It’s so important that before I go in to jump that my ponies are listening to me and ready for the task ahead. Louise and I have also been working on my posture and how effective I am when I ride . 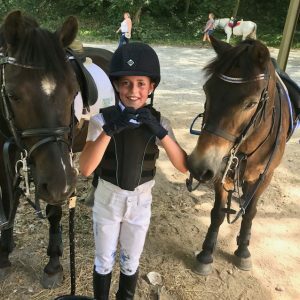 I’m a really little 9yo apparently and the ponies are like tanks to me so I’m relieved to have found a technique to help control them and a way to use the little strength I have effectively. Competing on a regular basis has been challenging this summer, the hot weather and hard ground conditions has meant we’ve had to adapt our feeding and exercise regime ! Juggy is 23 and doesn’t drink a lot of water at the best of time, so in order to keep him properly hydrated we’ve been adding grass pellets to his water. He drinks it really well. An hour after a hard workout we also give him an extra feed , handful of grass pellets soaked, handful of grass chop and half a bucket of water all mixed together, another way to keep him on top form. As the darker nights draw in, I have to ride as soon as I get home from school . 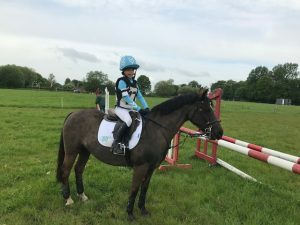 I really want to continue practising lots and lots so that I can hopefully be as good as my fellow Brand ambassador , Ros Canter.